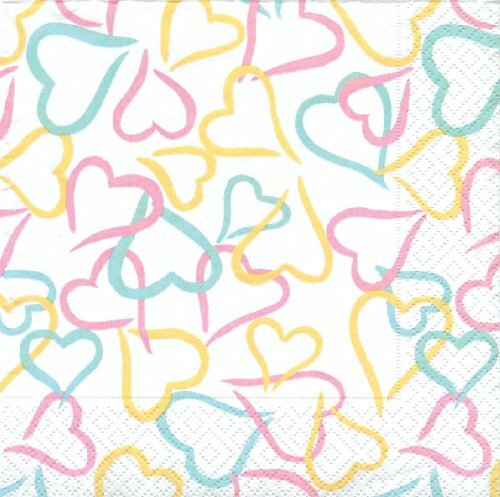 Entertaining With Caspari Lots of Love Pastel Cocktail Napkins, Pack of 20. Adapt the elegance of a formal table setting to everyday life with our luxury paper plates and napkins. Printed in Germany using non-toxic, water-soluble dyes on the softest three-ply tissue printable, these paper cocktail napkins have the feel of linen without the maintenance. Disposability means less time spent on clean-up and more time with friends and family. They are 100% biodegradable and compostable, combining convenience with sustainability. This pack contains 20 napkins, each measuring 5-inch square folded and 10-inch square open. Caspari - bringing style and convenience into your home every day. If you have any questions about this product by Caspari, contact us by completing and submitting the form below. If you are looking for a specif part number, please include it with your message.